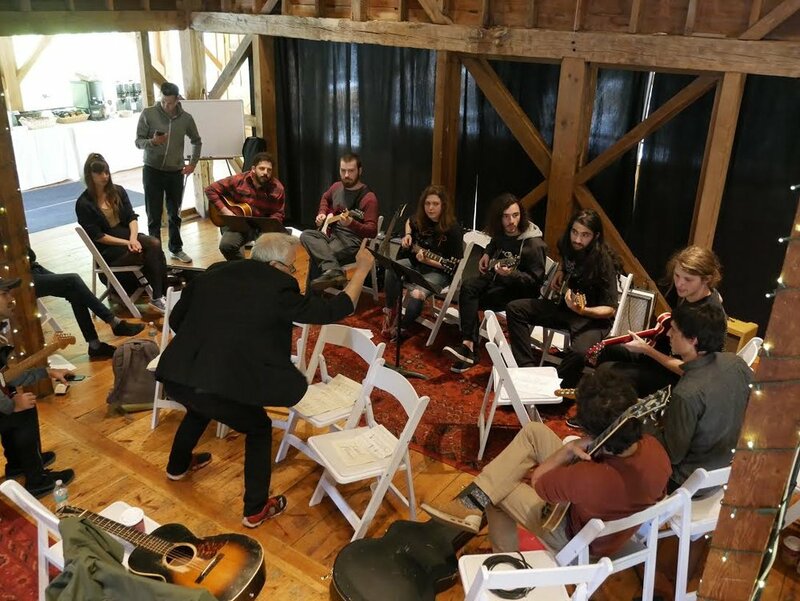 Greetings and welcome to year three of the most unusual, forward thinking, open-minded guitar camp on the planet! This year we are thrilled to welcome Mike Stern, widely considered one of the most important jazz guitarists of our generation. Mike's intersection of rock, funk, and jazz has fueled a remarkable career, whose highlights include stints with Miles Davis, Michael Brecker, and Dennis Chambers, as well as 6 Grammy nominations for his own work. His wife Leni Stern will be offering insights into blending jazz with traditional music from Mali and India. Ben Monder will discuss his endlessly inventive use of chords and his staggering single note runs that cross all stylistic boundaries, while Julian Lage will show us what it takes to become fantastically fluent in multiple styles of American music. And of course I will be on hand as well. "This camp represents the type of learning situation I longed for growing up, but could never find." Accommodations are charming in their simplicity, with guest rooms available in a variety of lodges – some B&B style with shared hallway baths and others with private bath options. Also available are the new, deluxe cottages which feature a king bed (or two twins), sitting area with couch, private deck, picture windows with panoramic views, air conditioning, mini-fridge, coffee maker, Smart TV, WiFi, and bathroom with dual head shower and radiant heat. Wi-Fi, cable television and complimentary phone service are all available at the Inn (please bring a phone card for international calls). Please Note: Cell phone reception is not reliable at Full Moon Resort or in Big Indian. Standard guest rooms do not have air conditioning, television, telephones or daily housekeeping service. Packages include all workshops, seminars, meals, performances, use of the grounds and your choice of accommodations. All activities will be held at Full Moon Resort which features an eclectic array of comfortable, rustic country-inn style accommodations including simple B&B style guest rooms with shared hallway baths as well as private guest rooms with private baths. Also available are premium cottages equipped with private deck with mountain views, air conditioning, television, radiant floor heating and dual head shower heads in the luxury and spacious bathroom. All accommodations are just steps away from the daily activities. The grounds offer a spring-fed swimming pool and one hundred acres of meadows, forests and streams. In addition, guests are welcome to explore the splendors of the Catskills on the nearby network of hiking trails. CANCELLATION: All payments and deposits are non-refundable. By registering, you hereby release Full Moon Resort, its employees, and all associated entities, from all claims, liabilities, loss to property, damages, injuries, etc. arising out of or in connection with your participation in any aspect Rhythm, Sound and Magic at Full Moon Resort. Full Moon Resort and Music Masters Camps reserves the right to take photos and/or video during.Rhythm, Sound and Magic and to use such photos and/or video for advertising and marketing purposes. By registering for Rhythm, Sound and Magic, you agree to release your photograph to Full Moon Resort. Music Masters Camps without compensation and understand that Full Moon Resort Music Masters Camps reserves all rights in regard to reproduction of said photograph.